Getting that perfect pumpkin patch photo! Okay. So, maybe not *perfect* (especially if you are taking photographs of your own children) … 😉 But I wrote this article for another Austin blog and thought I should put it on my own blog since this one was specifically related to photography! I’m an Aggie — so, I’m all about tradition! And this time of year, it seems to be a tradition to take your kiddos into the pumpkin patch and snap a few pics. So — I have a few tips and a few of my favorite pumpkin patches to share! 1. When is the best time to take pumpkin patch pictures? Today. No seriously. Go this week or this weekend before the pumpkins are scarce or gross (from being climbed on or kicked)! Go and get some photographs before it’s on everyone’s mind. I love photographs in the pumpkin patch where there aren’t a zillion other people in the background. And it’s easy to do at the beginning of October! Added bonus of doing them right now? You can make cards for family and friends! 2. The best time to take pictures in the pumpkins? A few minutes before sunrise or an hour or so before sunset! Oh, what? Your kids aren’t up, fed and dressed by 7:30AM? And sunset is right before bedtime? I get it — but if you want that lovely soft light, that’s the best time. But if that’s not an option — search for a pumpkin patch with some true shade (not from a tree) or wait for a cloudy day. Trees leave shadows everywhere and there’s nothing more distracting than a half shaded face. 3. How do you avoid the orange? Well, you don’t. The thing is, pumpkins are orange. So, we have to work around it. Since the orange is everywhere it means that it’s beaming up onto your subjects (and not many people look that great in orange). 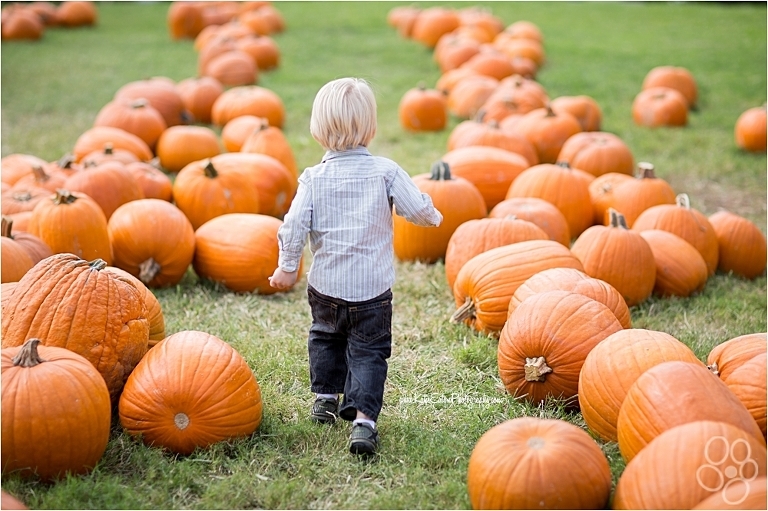 You can help avoid the orange color cast by positioning your kiddos so that the sun is behind them and their heads are slightly tilted up toward you and away from the pumpkins. Stand above them and shoot down … but not so much that their head looks uncomfortable … but enough that the orange color cast disapates. 4. Get creative with your shots. Use the pumpkins as leading lines. Get a picture of your child trying to lift a pumpkin twice their size. Bring a pad of paper and have your child sketch what they see and photograph them in action. Bring your own metal wagon and have them pull it up and down the aisles. Think outside the box and have fun with your kids! 1. Tarrytown United Methodist (all the pictures in this post are from this patch) — This is a beautiful patch — but only on a shaded day or at sunrise. They have lovely lines of pumpkins and beautiful trees. It’s large enough that you can bring dinner and have a picnic there. And the church backdrop is quite lovely. The downside of those trees is that in harsh sun, you get terrible shadows if you aren’t positioned juuuuuust right. You can get close to the tree stump and avoid the shadow but then just watch out for that harsh light behind your subject. 2. ACTS Church in Lakeway (Located at the corner of Ranch Road 620 and Debba Road) — at sunset. It’s so beautiful right at sunset … At this particular patch, I shoot into the sun so that my subjects are backlit but I get some lovely bokeh through the trees. It also has lines of pumpkins. The downside is that it’s literally right on 620 near a very busy intersection. I wouldn’t love it as much in the morning because shooting into the sun would mean you would have 620 as a backdrop vs. the trees and Lake Travis. 3. And a random one on highway 620 right in between the HEB and the Round Rock Hospital. I don’t know if they are doing it this year but I’ll drive by and get this updated if they are. I didn’t have luck with a google search … but it was very beautiful at sunset. These were taken there two years ago. If you are looking for a family adventure with hay rides and pumpkin painting and corn mazes then there are so many choices close to Austin. We’ve done Sweetberry and both of the ones in Elgin. The kids love these adventures … and the photography is great on a cloudy day. Can you tell that I try to avoid harsh sun? That’s because it creates squity eyes and bright features and harsh shadows! I have a large external flash with a diffuser that helps in those situations (to add fill light) … but I really don’t want to lug all of that around just to snap some pics of my kids. 5. Elgin Christmas Tree Farm (which is having a festival the 2nd and 3rd weekends of October).